One thing I enjoy most about Fall is the challenge to bring some natural elements inside when it’s still so hot outside. Not one beautiful orange or yellow leaf is to be found around here…so I had to get creative. 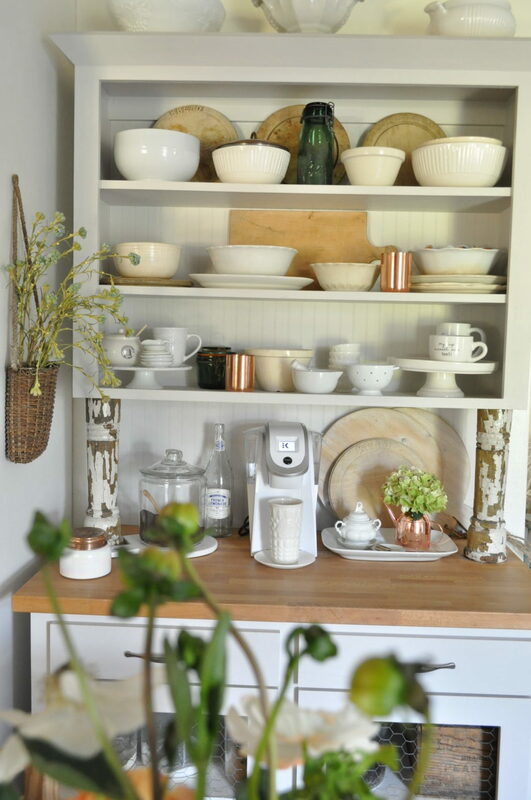 And I styled our kitchen in two different ways to show how you can change up a space easily with just a few things. I used green pear branches from our yard for a natural element to offset the faux boxwood wreath on the vent hood. 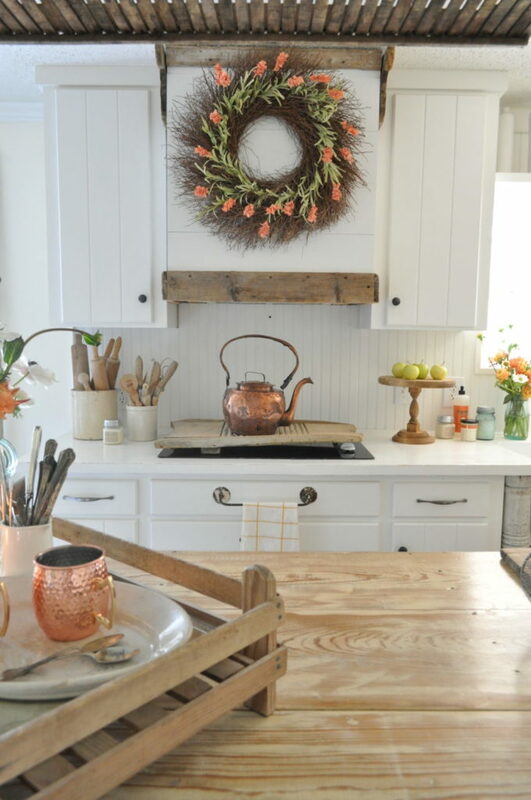 I love this wreath, because it can be used year round! The pears from a neighbor’s pasture is piled in the ironstone bowl, and atop the wooden cake stand from my friend Amy’s shop HERE. 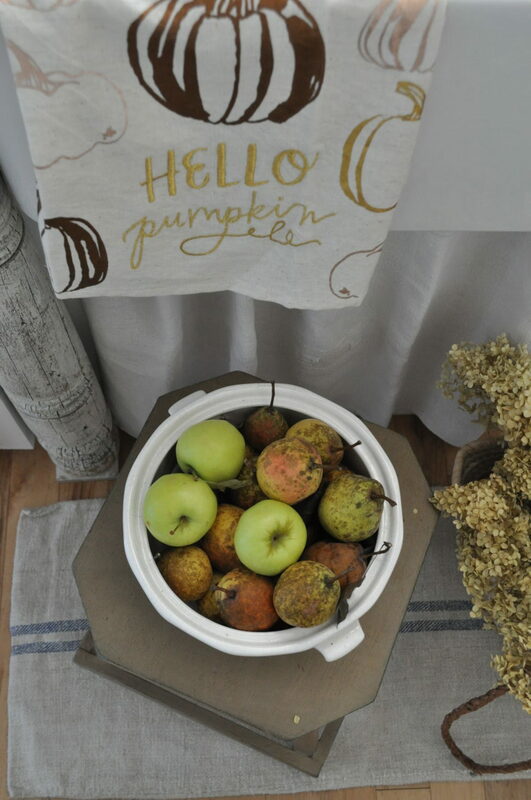 Fruit like apples and squash are also great for natural decor this time of year. 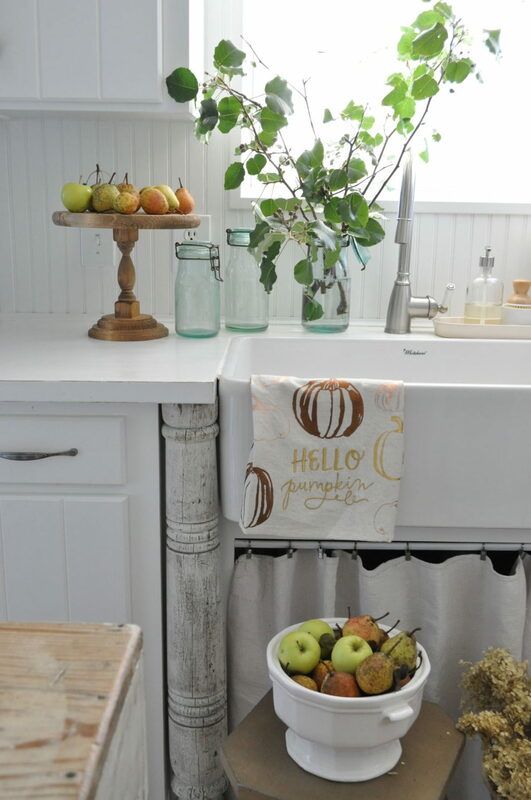 Now, the pretty pumpkin tea towel is a new purchase for me this year. I just couldn’t pass it up with it’s rose gold and copper pumpkins! For another natural element, I added dried hydrangea bundles to braided handle market basket (found in my shop here) . 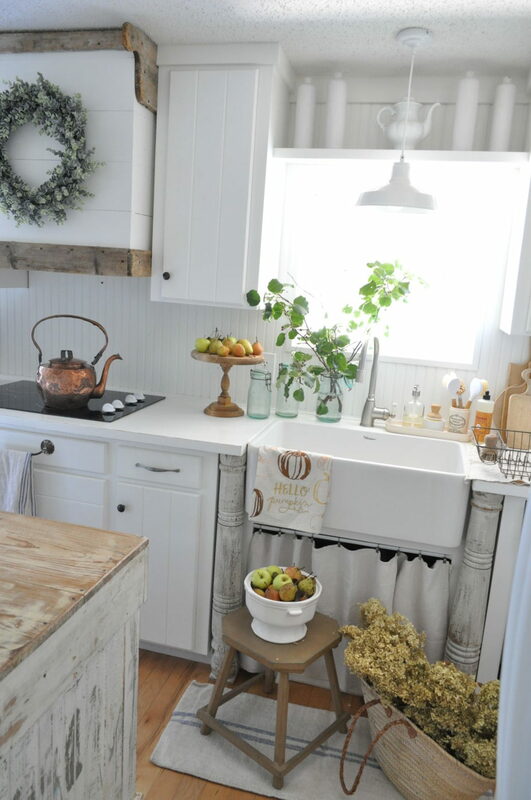 Now, the second way I styled the kitchen for Fall is with a few pops of color. I’m usually very simple with my Fall decorating…but that doesn’t mean I can’t have a little color, right? just take a natural wreath ( I already had this vine one from last year ) and add some faux stems. I had these from Hobby Lobby, and just pulled them a part. Then I stuck each stem down into the wreath. I like this kind of DIY, because I can still take it apart and use it again. The gorgeous fresh flowers are from Petal Driven HERE, and just added to the welcoming smell. Plus, the pretty pops of color matched the wreath! And I can not let you miss out on the most amazing Fall scented candles EVER, HERE! As you can see, our island is quite large…it’s really the only nice size workspace I have in the kitchen. So, I like to add a tray of some type to corral most used items. 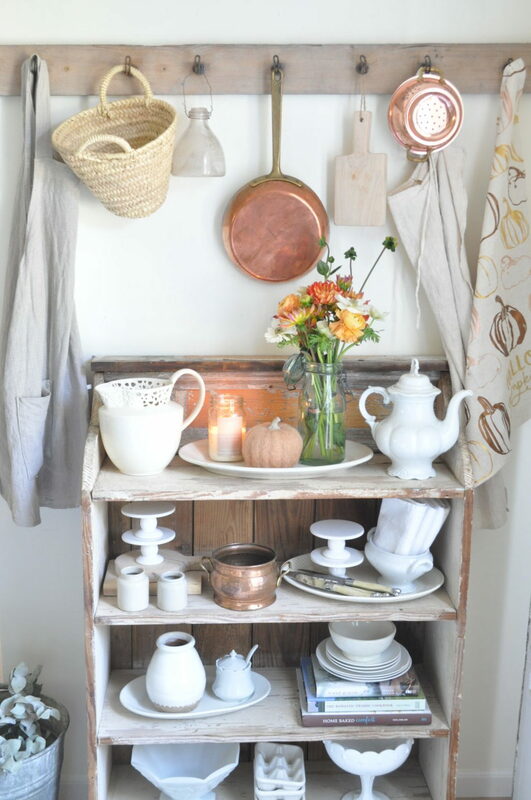 I used a vintage fruit crate, and placed these COPPER MUGS for coffee and fresh flowers with a candle. 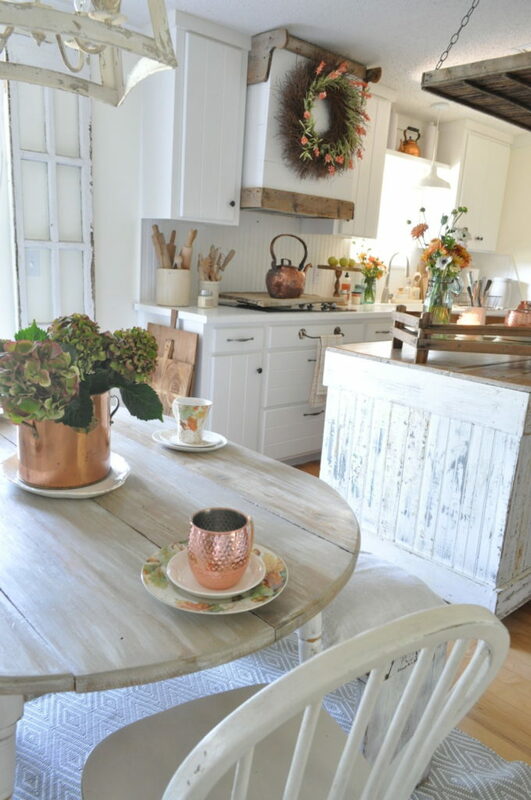 I always get asked where I found the vintage copper kettle…and it’s from a local Antique Shop! We have a few very nice shops to find vintage items around the Shreveport-Bossier City community. And guess what!? I now am a vendor at Kings Antiques and More on Kings Hwy, if you are local…I’d love for you to come shop!! 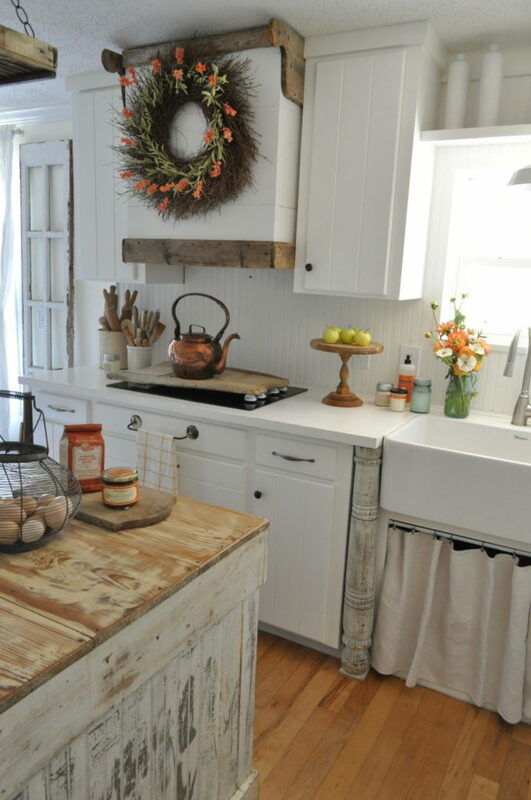 So, please leave a comment, and tell me which Fall style kitchen was your favorite?? It all looks so gorgeous Becky! You have such wonderful ideas and tips!! I like them both but I am a color girl! Those home-grown pears are pretty cute tho!